2. People talk a lot about the Jewish lobby. But the worldwide Muslim lobby is bigger, comprising, among other components, 54 Muslim-majority states in the United Nations. Many Muslims naturally sympathize with the Palestinian cause. They make their voices heard, and they help shape a global anti-Israel narrative, in particular by focusing relentlessly on Gaza to the exclusion of conflicts in which Muslims are being killed in even greater numbers, but by Muslims (I wrote about this phenomenon here). 3. If you've spent any time these past few weeks on Twitter, or in Paris, you know that anti-Semitism is another source of Israel’s international isolation. One of the notable features of this war, brought to light by the ubiquity and accessibility of social media, is the open, unabashed expression of vitriolic Jew-hatred. Anti-Semitism has been with us for more than 2,000 years; it is an ineradicable and shape-shifting virus. The reaction to the Gaza war—from the Turkish prime minister, who compared Israel's behavior unfavorably to that of Hitler's, to the Lebanese journalist who demanded the nuclear eradication of Israel, to, of course, the anti-Jewish riots in France—is a reminder that much of the world is not opposed to Israel because of its settlement policy, but because it is a Jewish country. 4. Israel’s political leadership has done little in recent years to make their cause seem appealing. It is impossible to convince a Judeophobe that Israel can do anything good or useful, short of collective suicide. But there are millions of people of good will across the world who look at the decision-making of Israel’s government and ask themselves if this is a country doing all it can do to bring about peace and tranquility in its region. Hamas is a theocratic fascist cult committed to the obliteration of Israel. But it doesn’t represent all Palestinians. Polls suggest that it may very well not represent all of the Palestinians in Gaza. There is a spectrum of Palestinian opinion, just as there is a spectrum of Jewish opinion. An old foreign correspondent friend of mine, once based in Jerusalem, has turned to blogging. As the story he used to cover flared up once more, he wrote: “This conflict is the political equivalent of LSD – distorting the senses of all those who come into contact with it, and sending them crazy.” He was speaking chiefly of those who debate the issue from afar: the passions that are stirred, the bitterness and loathing that spew forth, especially online, of a kind rarely glimpsed when faraway wars are discussed. While an acid trip usually comes in lurid colours, here it induces a tendency to monochrome: one side is pure good, the other pure evil – with not a shade of grey in sight. But the LSD effect also seems to afflict the participants in the conflict. They too can act crazy, taking steps that harm not only their enemy but themselves. Again and again, their actions are self-defeating. Start with Israel – and not with the politicians and generals, but ordinary Israelis. Right now they are filled with the burning sense that the world does not understand them, and even hates them. They know Israel is being projected on the world’s TV screens and front pages as a callous, brutal monster, pounding the Gaza strip with artillery fire that hits schools, hospitals and civilian homes. They know what it looks like – but they desperately want the world to see what they see. In their eyes, they are only doing what any country – or person, for that matter – would do in the same position. They ask what exactly would Britain do if enemy rockets were landing on our towns and villages. Would we shrug our shoulders, keep calm and carry on – or would we hit back? But it’s not the rockets that frighten them most. Israelis focus more on the hidden tunnels dug under the Gaza border, apparently designed to allow Hamas militants to emerge above ground and mount raids on Israeli border villages and kibbutzim, killing or snatching as many civilians as they can. Israel’s Iron Dome technology can zap incoming rockets from the sky, but what protection is there against a man emerging from a tunnel in the dark determined to kill you? The fact that tranquillisers and handcuffs were reportedly found in those tunnels, ready to subdue Israeli captives, only leaves Israelis more terrified. This is why they wanted their government to hit back hard: remember, it was the discovery of the tunnels that prompted the ground offensive. Some Israelis see the terrible images of Palestinian suffering – children losing their limbs, their lives or their parents – and they want the world to see it as they do: that Hamas shares in the blame for those cruel deaths, because it does so little to protect its civilians. You might discount the argument that Hamas fights its war from civilian areas (replying that it’s hardly going to locate itself in open ground, wearing a target on its back). But the UN itself has condemned Hamas for stashing rockets in a UN school. And in the quiet years, when Hamas finally got hold of long-demanded concrete, it used it not to build bomb shelters for ordinary Gazans, but those tunnels to attack Israel, and bunkers for the organisation’s top brass. I know that every one of those points can be challenged. The point is not that they represent unarguable truth but that they come close to how many – not all – Israelis feel. They believe they face in Hamas an enemy that is both explicitly committed – by charter – to Israel’s eradication, and cavalier about the safety of the Palestinian people it rules. They fear Hamas, its tunnels and its rockets, and they want security. But here is where the madness kicks in. Israelis want security, yet their government’s actions will give it no security. On the contrary, they are utterly self-defeating. Before the current round of violence, the West Bank had been relatively quiet for years. Friday saw a “day of rage,” with several Palestinians killed and talk of a third intifada. An operation designed to make Israel more secure has made it much less. If that is true now – with the prospect of an uprising encompassing not just the West Bank but some of the 1.7 million Palestinian citizens of Israel as well – it’s truer still in the future. For every one of those Gazan children – their lives broken by pain and bloodshed three times in the past six years – will surely grow up with a heart hardened against Israel, some of them bent on revenge. In trying to crush today’s enemy, Israel has reared the enemy of tomorrow. Security requires more than walls and tanks. It requires alliances and support. Yet every day Israel is seen to be battering Gaza, its reservoir of world sympathy drops a little lower. And that is to reckon without the impact of this violence on Israel’s own moral fibre. After 47 years of occupation and even more years of conflict, the constant demonisation of the enemy is having a corrosive effect: witness the “Sderot cinema”, the Israelis gathering in lawn chairs on a border hilltop to munch popcorn and watch missiles rain down on Gaza. No nation can regard itself as secure when its ethical moorings come loose. The only real security is political, not military. It comes through negotiation, not artillery fire. In the years of quiet this should have been the Israeli goal. Instead, every opening was obstructed, every opportunity spurned. And the tendency to self-harm is not confined to Israel. Hamas may have reasserted itself by this conflict, renewing its image as the champion of Palestinian resistance. But it’s come at a terrible price. After an escalation that was as much Hamas’s choice as Israel’s, 800 Palestinians are now dead, 5,400 are injured and tens of thousands have been displaced. For those Palestinians yearning for a state that will include the West Bank, that goal has been rendered even more remote: what, Israelis ask, if the West Bank becomes another Gaza, within even closer firing range of Ben Gurion airport? This is the perverse landscape in which both Israelis and Palestinians find themselves. They are led by men who hear their fear and fury – and whose every action digs both peoples deeper into despair. Israel wants peace? Perhaps, but as the veteran Israeli journalist Gideon Levy has pointed out, it does not want a just peace. Occupation and creeping annexation, an inhumane blockade, the destruction of olive groves, the arbitrary imprisonment of thousands, torture, daily humiliation of civilians, house demolitions: these are not policies compatible with any desire for a just peace. In Tel Aviv Gideon Levy now moves around with a bodyguard, the price of speaking the truth. I have visited Gaza and the West Bank. I saw multi-generational Palestinian families weeping in hospitals around the bedsides of their wounded, at the graves of their dead. These are not people who do not care about life. They are like us — Canadians, Jews, like anyone: they celebrate life, family, work, education, food, peace, joy. And they are capable of hatred, they can harbour vengeance in the hearts, just like we can. “People’s leaders have been misleaders, so they that are led have been confused,” in the words of the prophet Jeremiah. The voices of justice and sanity are not heeded. Netanyahu has his reasons. Harper and Obama have theirs. And what shall we do, we ordinary people? I pray we can listen to our hearts. My heart tells me that “never again” is not a tribal slogan, that the murder of my grandparents in Auschwitz does not justify the ongoing dispossession of Palestinians, that justice, truth, peace are not tribal prerogatives. 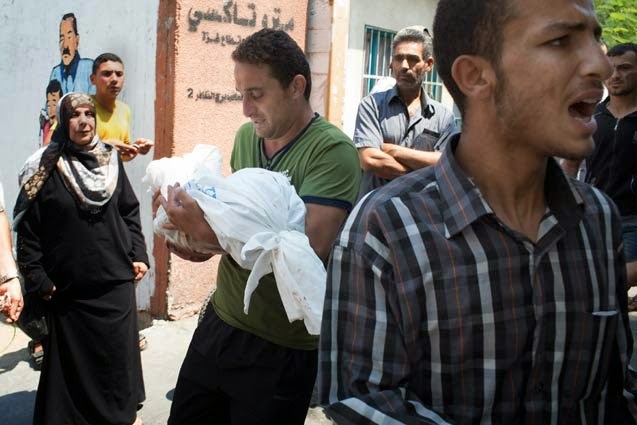 That Israel’s “right to defend itself,” unarguable in principle, does not validate mass killing. A few days ago I met with one of my dearest friends, a comrade from Zionist days and now professor emeritus at an Israeli university. We spoke of everything but the daily savagery depicted on our TV screens. We both feared the rancour that would arise. But, I want to say to my friend, can we not be sad together at what that beautiful old dream of Jewish redemption has come to? Can we not grieve the death of innocents? I am sad these days. Can we not at least mourn together? That op-ed article elicited many comments from people taking sides on the Mideast crisis. It struck a chord with me personally because he's right, the world can't just sit back and watch children, women and elderly being slaughtered in Gaza and pretend they're just innocent casualties of an endless conflict. We should all mourn this tragedy. But the reality is Hamas is using humans as shields to keep rocketing Israel, knowing full well they will win the propaganda war as gruesome images of dismembered dead children are portrayed in the global and social media. Hamas couldn't care less about the children and women being killed, they are fully committed to the destruction of Israel, and will stop at nothing to achieve this. Nonetheless, another reality is that Israel is a military superpower which can literally crush anyone in the region. The problem with the Israeli Defense Forces (IDF) leveling Gaza is that it looks like a massive disproportionate response to the murder of three Israeli teenagers, which were not killed by Hamas according to the latest analysis. And there is no reason to believe that all this bloodshed will secure Israel. In fact, previous military campaigns in Gaza only emboldened the radicals and made them stronger. This is my worst fear. We've seen this play out over and over and the strategies of hard liners on both sides have failed miserably to secure long-lasting peace in the region (see Haaretz article, It isn't easy being an Israeli leftist during wartime). As far as the Americans, they too have "blood on their hands." At one point, they have got to lead and bring long-lasting peace to the region. Below, CNN's Paula Hancoks reports on the ongoing Israel and Hamas conflict, evaluating whether the two can peacefully co-exist. I have my doubts and fear that things are only getting worse, not better.